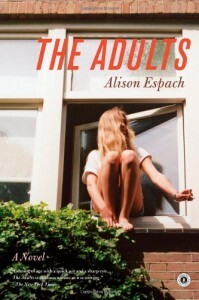 The Adults by Alison Espach is a really unique coming of age story. The narrator, Emily Vidal, is 14 years-old and lives in a suburban neighborhood in the 90s. The author really captures the voice of a teenage girl who's experiencing all the complications of growing up and dealing with a dysfunctional relationship with her parents. Emily is a really captivating narrator, with a snarky and twisted sense humor which makes her even more entertaining. Also captivating, is Emily’s interpretation of the transition she’s going through: the way she perceives it in relation to the people around her and her interesting observations on what distinguishes children from “The adults”, and how those differences affect the dynamics between them. "But I was never scared. I knew our lives were just beginning and that their lives were ending, and how strange it seems to me now that this was a form of leverage." A central element in this story is Emily’s relationship with Jonathan (Mr.Basketball), a teacher at her high school. I think this novel offers a particular approach to the teacher-student relationship. The author doesn’t try to soften the illegal/forbidden nature of their relationship, doesn’t try to make it more pleasant to satisfy the reader, instead, she offers a raw and candid approach while simultaneously manages to instill a really deep, beautiful and melancholic quality to their bittersweet love story. We follow Emily until her late twenties - In her early 20s, the story is set in Prague, where she’s living with her father and half-sister. The development of Emily’s relationship with her younger sister, Laura, really stands out to me. I found it to be very perceptive, it made me reflect about my own relationship with my half-sisters and I think it shows a deep understanding of the nature and complexity associated to this kind of relationships. Finally, I have to say that the writing is exceptional and I would love to read more from Alison Espach. The Adults is an original, intelligent, captivating, moving and thought-provoking coming of age story, a truly memorable "record of change". "Children's lives are always beginning and adults' lives are always ending. Or is it the opposite? Your childhood is always ending and your adult self is always beginning. You are always learning how to say good-bye to whoever you were at the dinner table the night before."